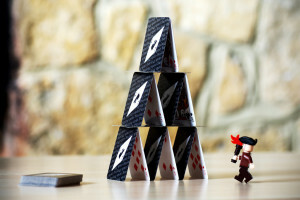 A house of cards being attacked by a pirate. Seems perfect, somehow. If you’ve looked around the internet on this subject, you’ll probably have heard of the Big 6. That is, the Big 6 publishing houses in the industry. You may also have heard that two of them are merging: Penguin and Random House. Is this a good thing? From what I have seen, no. Not for the industry and not for authors. (See Smashwords’ blog post from back in December 2012 for the indie view on this (scroll down to #16), and the interview with published author Michael Levin on the BBC’s World Business Report on 5th April (start at 6:10). A merger of this kind requires permission from organisations that ensure competition is preserved in the markets. The US was first to agree to the merger back in February; the EU followed suit more recently. No-one seems concerned that two such big movers in the industry combining into a publishing megalith will create a monopoly, and this fact in itself it very interesting to those of us looking into publishing. So it doesn’t sound good. They’re not doing anything new or different, despite the changes in the market around them, and this is the crux of my problem with traditional publishing. I see so much change in the publishing industry, all the time, so much that I have no chance of providing anything close to a decent commentary on this blog. I’m simply not equipped to keep up (this post is woefully late with this news). But I try to hit the highlights. Worryingly, the actions of the big houses only seem to be heading in bad directions for both authors and the industry as a whole. Why? Well, settle in and I’ll attempt to explain my position. For authors, it’s not a good move because the new Penguin Random House entity will continue to operate as it always has. I did a whole post on Marketing not so long ago, and what authors should be able to expect from a traditional contract. However, according to Levin (who has been published by all of the big houses), the Big 6 only give real marketing support to their top 1-2% of books. Each new book is a new brand, and a new cost for them. Their top 1-2%. You fought to get a publishing contract with an awesome publisher, and your book might be in bookstores for 3-4 weeks before it gets pulled, because it’s not selling, because it wasn’t marketed. As a first-time author, you’re lucky if you get much of an advance as well, so your chances of making money from your work or becoming a known name are very slim. I’m a pretty cynical person when it comes to politics and corporate activity, but this is worse than even I imagined. So they’re not doing their authors any favours. But how does this impact on the industry as a whole, I hear you ask? Well, if books that are good enough to be published are being treated in this way – barely marketed, and pulled from shelves for poor sales, and generally not sold all that well – then those are good books that are being removed from the market and the kind of publishing where they might have thrived. Here’s a radical (and rather scary thought) for you: the Big 6 could be reducing the overall quality of the books on the market. The traditional publishers seem to be sandbagging their operations against the tide of small and independent publishing. Are they making the right moves? From what we can see so far, no. It’s more of the same stuff that’s driving authors into the wide-open arms of independence. Even the monopoly committees agree that the moves they’re making won’t give them a huge advantage in the marketplace. These are all things to keep in mind if you’re considering a traditional publishing contract. It’s a warzone out there. This reminds me of an item I heard on the radio a few years ago (I think it was about 5-10 years ago). They interviewed an author and an industry expert and the consensus was that, unless a writer could make blockbusters, publishing companies were not interested. The author had been dropped because, alfthough his publishers made a profit on his works, he didn’t reach a mainstream audience. I suspect that the growth of self-publishing meant that publishers went back to offering people the hope of being published to cease from being completely irrelevant. Sword and Laser recently mentioned this blog post, in which the author says that the vast majority of writers (both best-sellers and others) would be better off self-publishings. You may be also be interested in this programme. …would be better off self-publishing. Sorry, for this 3rd post, I was refering to my first post. I’ve heard similar things, Francisco! Mid-list authors with proven sales records struggle to get books picked up because publishing hosues are more interested in the next big (new) thing. If you’re not at the top of the tree, pubilshing houses might publish your book, but they’re not going to throw their weight behind you. It’s hard not to see the trends as a push towards self-publishing. A part of me feels this is unfair to publishing houses. A part of me agrees that they’re digging their own holes and driving authors away. As I get closer to editing Starwalker, I know I’m leaning towards self-publishing again, and this is a big part of the reason why.